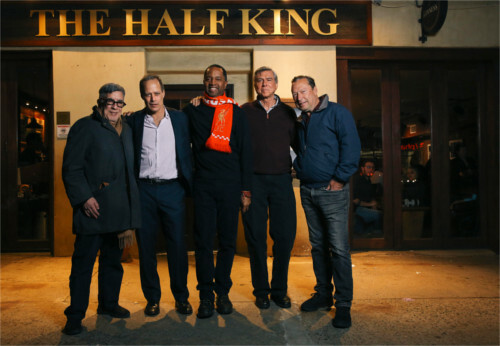 After 18 years in business, The Half King bar and restaurant in Chelsea closed its doors at the end of January 2019. Earlier that month, the owners held a farewell party, packed with longtime patrons. Among them were members of the Overseas Press Club. Since 2014, OPC hosted several monthly mixers in the bar’s private room. When Sebastian Junger, Scott Anderson and Nanette Burstein opened The Half King, I was living in Chelsea, which was still rough around the edges. At the time, I was covering the AIDS crisis in South Africa, Zimbabwe and Kenya. When I got home, I needed a place where I could sit, decompress and recharge myself. After a difficult assignment, you need a place to share your experiences with fellow journalists, photojournalists, or writers, knowing you never have to end the conversation with, “well, I guess you just had to be there.” More than a social outing, going to The Half King helped preserve my mental health. Places like The Half King are increasingly rare. They serve as anchors of a community – both physically and spiritually. “We wanted to create a place where people in the journalism and publishing professions could meet,” said Junger. And for nearly two decades, this is what The Half King offered: a place to socialize, gossip, and work. It was that rare establishment where the creative community could share their work with the public, through readings, screenings and photo exhibits. At the end of the farewell party, I was reminded of Ted Kennedy’s 1980 concession speech: “For all those whose cares have been our concern, the work goes on, the cause endures, the hope still lives, and the dream shall never die.” The Half King may have closed, but its dream will live on.